It is important for a new dad to know that these are really natural feelings. You can support your pregnant wife by being a comforter when she needs it, reassuring her if this is the first baby, that she will be a great mum, and letting her know you will always be there to help. Lots of communication, tenderness, patience, and responsiveness are helpful attitudes during this important time. 1. Help your partner stay healthy during pregnancy - Help her eat lots of different healthy foods. Good choices include whole grain breads, cereal, milk, yogurt; low-fat meat and chicken; and lots of fruits and vegetables. And watch what you eat, too! If you eat right, you'll make it easier for her. 2. Encourage her to exercise - Exercise is a great thing you can do together. Walking is easy and inexpensive. Check with your partner's physician to find out the safest kinds of exercise you can do together. 3. Take care of the house - Whether you clean it yourself or hire a service, taking care of as many household chores as possible will prevent her from feeling overwhelmed. Get another family member to help you if necessary. 4. Listen to Her - Guys tend to be fixers by nature. You see a problem, and you find the solution. Re assure her that she is not at fault. 5. Take Her Out - Isolation is a big factor, so the sooner she gets a change, the quicker she may come around. 6. Let Her Know You are Proud of her - Tell your wife that you know she's doing the best she can, and this can have a larger impact than you may think. Let her know that you see the effort she is putting is quite right and well. 7. 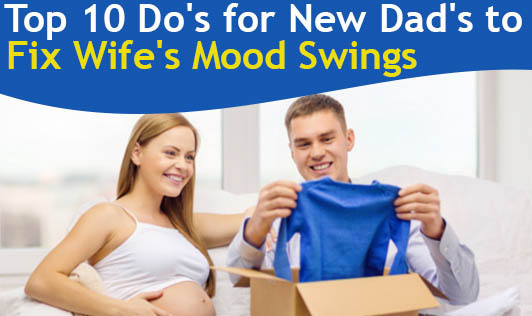 Be patient - Mood swings can last a few weeks, a few months, or even a few years. You will need to be patient. Know that with treatment, and support, your wife will get better. 8. Don't Wait For Her To Ask - Your wife may not ask for help. She may be in denial that she needs help. So just do it to prevent her from post partum depression. 9. Help your partner get rest and lower her stress - Tune into soft music, get her some books that she likes, speak to her about the kid's new arrival and help her get adequate rest when she needs. This is good for her and the baby. 10. Make sure to accompany your wife to the doctor for the routine check-ups ad ultrasounds to see your unborn baby.